Chiropractic Adjustments and Artery Dissection: Is Your Neck in Safe Hands? You are here: Home / Cardiovascular Disorders / Chiropractic Adjustments and Artery Dissection: Is Your Neck in Safe Hands? Cervicocerebral arterial dissections are increasingly recognized as a cause of stroke, particularly in young people. The term “cervicocerebral arterial” refers to the arteries in the neck and brain, while the term “dissection” refers to a tear in the inner wall of a major artery. An arterial dissection leads to the intrusion of blood within the layers of the artery wall. Depending upon which layers blood collects, an arterial dissection can cause narrowing of the channel within the artery (termed stenosis), which restricts blood flow, or an aneurysmal dilation, meaning a localized, blood-filled bulge in the artery wall. Although neck trauma preceding a cervicocerebral arterial dissection is common (including trivial injury such as vigorous nose blowing), several genetic connective tissue disorders are associated with cervicocerebral arterial dissections, including vascular Ehler-Danlos syndrome (EDS), an autosomal dominant disorder with mutations in the gene that encodes collagen, type I, alpha 1 (gene symbol COL1A1)  and fibromuscluar dysplasia (FMD), a non-inflammatory disease of medium sized arteries mainly affecting the carotid and renal arteries . Cervicocerebral arterial dissections are most common between the ages of 35 and 50 years, with peak incidence in the 50’s , and account for up to 20% of strokes in patients less than 45 years of age . Cervicocerebral arterial dissections include carotid artery dissections and vertebral artery dissections. 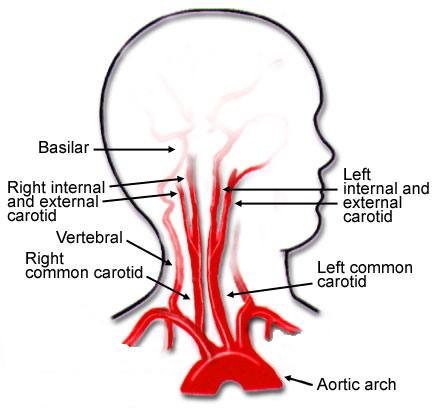 Carotid artery: a principle artery located in the front of the neck that carries blood from the heart to the brain. There are two carotid arteries — the right and left common carotid arteries — on each side of the neck. Vertebral artery: a principle artery located in the back of the neck that carries blood from the heart to the brain. There are two vertebral arteries that ascend on each side of the body through the spinal column. The path is largely parallel to, but distinct from, the route of the carotid artery ascending through the neck. Inside the skull, the two vertebral arteries join to form the basilar artery. In each arterial system, the segment of artery involved can be extracranial, meaning a dissection involving the artery in the neck before it enters the brain, or intracranial, meaning a dissection involving the artery after it has entered the brain. Extracranial dissections are more common than intracranial, explained by the fact that extracranial artery segments are more mobile and prone to damage by the vertebrae. However, intracranial dissections are typically more severe and have a poorer prognosis than extracranial dissections. Carotid artery dissections are at least three times more common than vertebral dissections . Early detection is important, since cervicocerebral arterial dissections can cause neurological deficits, including weakness, paralysis of a limb or the entire body, impairment of hearing or vision, impairment or loss of speech, disturbance or loss of sensation, and tremors, due to thromboembolism (meaning the formation of a clot in a blood vessel that breaks loose and is carried by the blood stream to block another vessel) as well as hemodynamic failure due to arterial stenosis. Hemodynamic failure occurs when the brain is not receiving the normal amount of oxygenated blood. Patients presenting with early dissection (with no related aneurysm or significant stroke) are treated with antithrombotic drug therapy to prevent thrombus formation, either with anticoagulation (e.g. warfarin, Coumadin) or antiplatelet (e.g. Plavix) agents. Surgical treatment is typically reserved for dissecting aneurysms and advanced stroke symptoms from the dissection. However, meta-analysis of controlled clinical trials assessing the efficacy of anticoagulants or antiplatelets for the treatment of extracranial internal carotid artery dissection, randomized controlled trials, and non-randomized trials failed to demonstrate evidence to support their routine use . Indeed, the authors suggest that aspirin is likely to be effective and is safer than anticoagulents for patients with carotid artery dissection. Arterial dissections are dynamic processes. Although the radiographic appearance may worsen during the acute phase of dissection, approximately 90% of stenoses eventually resolve, two-thirds of blockages open and one-third of aneurysms decrease in size . Indeed, asymptomatic cervicocerebral dissections do not require any medical intervention and typically resolve on their own. It seems every few years, the media focuses its attention on the relationship between chiropractic neck manipulation and cervical artery dissection. The first case of carotid artery dissection due to neck manipulation by a chiropractor was reported sixty years ago , and in the years following there have been a number of studies and case reports published. A new study indicates that there is no increased risk of arterial dissection and stroke with chiropractic neck manipulation . The findings, published in the journal Spine, elucidate the results of an earlier study that suggested that chiropractic neck adjustment resulted in some patients suffering a stroke after treatment . Canadian researchers investigated the associations between chiropractic visits and vertebrobasilar artery stroke. Vertebrobasilar artery refers to the vertebral arteries, which are susceptible to compression with neck rotation, and the basilar artery (the artery formed by the junction of the two vertebral arteries). The researchers also compared their results with primary care physician visits and vertebrobasilar artery stroke. The study included patients that had incident vertebrobasilar artery stroke and were admitted to Ontario hospitals between 1993 and 2002. Each case included four controls that were age and gender matched. Health billing records the year prior to the stroke date were used to determine case and control visits to chiropractors and primary care physicians. Compared to the earlier study, which found that there is a one-in-5.85-million risk of stroke from chiropractic adjustment, Canadian researchers investigated the relationship between chiropractic visits and vertebral artery stroke and, as one type of control, compared the results to family doctor visits that preceded the same kind of stroke. Reviewing nine years worth of data, scientists found only 818 patients that had vertebrobasilar stroke. Patients less than 45 years of age were approximately 3 times more likely to see a primary care physician or chiropractor preceding their stroke than controls (meaning patients that did not have a stroke). Although there was no increased association between chiropractic visits and vertebrobasilar artery stroke in patients older than 45 years of age, positive associations were found between primary care physician visits and vertebrobasilar artery stroke in all age groups. Although there was an increased association between chiropractic visits and stroke, it was the same as when patients visited a family doctor! Scientists interpret this surprising result to indicate that patients seeking either medical or chiropractic care for neck pain have already damaged the vertebral artery. Although a stroke occurred following the visit, the damage that caused the stroke was present prior to the medical or chiropractic visit. The risk of arterial dissection is small when cervical spinal manipulation is performed. Nevertheless, patients who have other risk factors for cervicocerebral arterial dissection, including hypertension, migraines, use of oral contraception and smoking , should avoid chiropractic neck adjustment. Symptoms of vertebral artery dissection include headache and/or neck pain, vertigo, an abnormal sensation — typically tingling or pricking — on one side of the face, and visual field defects . Although the risk of a vertebrobasilar artery dissection occurring after a chiropractic neck adjustment is small, it does happen. However, based upon these data, the risk of it happening is not any greater than after a primary care physician visit. Have you ever had an arterial dissection? What do you think the relationship is between chiropractic neck adjustment and artery dissection? Pepin et al. Clinical and genetic features of Ehlers-Danlos syndrome type IV, the vascular type. N Engl J Med. 2000 Mar 9;342(10):673-80. Chabriat et al. Vasculopathies. In: Alberts MJ, ed. Genetics of cerebrovascular disease. New York: Futura, 1999. Schievink et al. Recurrent spontaneous cervical-artery dissection. N Engl J Med. 1994 Feb 10;330(6):393-7. Bogousslavsky and Pierre. Ischemic stroke in patients under age 45. Neurol Clin. 1992 Feb;10(1):113-24. Thanvi et al. Carotid and vertebral artery dissection syndromes. Postgrad Med J. 2005 Jun;81(956):383-8. Lyrer and Engelter. Antithrombotic drugs for carotid artery dissection. Cochrane Database Syst Rev. 2003;(3):CD000255. Schievink WI. Spontaneous dissection of the carotid and vertebral arteries. N Engl J Med. 2001 Mar 22;344(12):898-906. Pratt-Thomas and Berger. Cerebellar and spinal injuries after chiropractic manipulation. JAMA 1947;133:600-3. Cassidy et al. Risk of Vertebrobasilar Stroke and Chiropractic Care: Results of a Population-Based Case-Control and Case-Crossover Study. Spine. 2008 Feb 15;33(4S), S176-S183. Haldeman et al. Arterial dissections following cervical manipulation: the chiropractic experience. CMAJ. 2001 Oct 2;165(7):905-6. Haldeman et al. Risk factors and precipitating neck movements causing vertebrobasilar artery dissection after cervical trauma and spinal manipulation. Spine. 1999 Apr 15;24(8):785-94. Saeed et al. Vertebral artery dissection: warning symptoms, clinical features and prognosis in 26 patients. Can J Neurol Sci. 2000 Nov;27(4):292-6.